The main objective of root canal treatment is thorough mechanical and chemical cleansing of the entire pulp space followed by complete obturation with an inert filling material. Therefore, it is imperative that aberrant anatomy is identified prior to, and during the root canal treatment of such teeth. In 1974, Vertucci and William  described the presence of an independent middle mesial canal in a mandibular first molar. Since then unusual canal anatomy associated with mandibular first molar has been reported in several clinical studies / case reports. The present case report describes root canal treatment in a mandibular first molar with three separate root canal orifices and a single exiting foramen. A 20-year old female patient was referred to our department of Conservative Dentistry and Endodontics with the chief complaint of pain in the lower right back tooth since the past 3 days. Her medical history was non-contributory. Clinical examination revealed a deep disto-occlusal carious lesion in relation to right mandibular first molar (tooth # 46). The tooth was tender to vertical percussion. There was no tenderness on palpation in buccal and lingual vestibule. Tooth mobility and periodontal probing around the tooth was within physiologic limits. Thermal and electrical pulp testing elicited a negative response. The preoperative radiograph demonstrated a disto-occlusal radiolucency approaching the pulp space and widening of periodontal ligament space in relation to the mesial and distal root apices [Figure 1]a. A diagnosis of necrotic pulp with symptomatic apical periodontitis was established and endodontic therapy was scheduled. Following local anaesthesia, an endodontic access cavity was prepared under rubber dam isolation on tooth # 46. Examination of pulp chamber floor revealed five distinct root canal orifices: two were detected mesially (mesiobuccal and mesiolingual); and, three distally (distobuccal, middle distal and distolingual) [Figure 1]b. 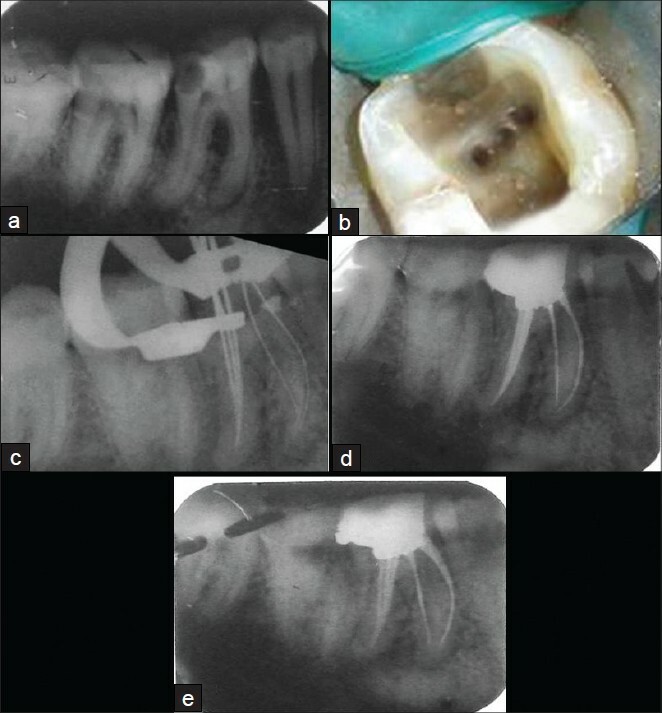 Three canals in the distal root were confirmed on radiograph [Figure 1]c. Cleaning and shaping of canals was done, and the canals were dried with absorbent points. The obturation was done by cold lateral compaction of gutta-percha [Figure 1]d,e. The patient was asymptomatic during the follow-up period. Usually, a prudent inspection of the pulp chamber floor by proper visualization allows the clinician to search for additional canals. Proper and thorough instrumentation is one of the key factors in the success of endodontic therapy; therefore, the clinician should be aware of the incidence of these extra canals in the mandibular first molar. 1. Vertucci FJ, Haddix JE, Britto LR. Tooth morphology and access cavity preparation. In: Cohen S, Hargreaves KM, editors. Pathways of the pulp, 9 th ed. St. Louis, MO, USA: Mosby; 2006. p. 148-232. 2. Vertucci F, Williams R. Root canal anatomy of the mandibular first molar. JNJ Dent Assoc 1974;48:27-8. 5. Mushtaq M, Farooq R, Rashid A, Robbani I. Spiral computed tomographic evaluation and endodontic management of mandibular first molar with three distal canals. J Conserv Dent 2011;14:196-8. 6. Sert S, Bayirli GS. Evaluation of the root canal configurations of the mandibular and maxillary permanent teeth by gender in the turkish population. J Endod 2004;30:391-8.